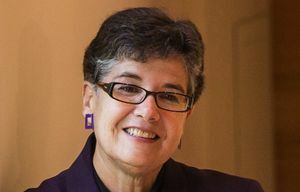 The chairman of the University of Washington’s Board of Regents and other key officials communicated as if they knew Ana Mari Cauce would be named the university’s president days before the board publicly voted to appoint her last October, emails and other records show. The records, obtained by The Seattle Times through a state Public Records Act request, bolster suspicions by several open-government advocates that regents likely violated the state’s Open Meetings Act by seemingly deciding to appoint Cauce before holding a public vote. The nearly 1,100 pages of records released this month — the first batch provided to The Times more than four months after the newspaper requested the records — mostly include emails sent to and from UW regents, search-committee officials and other employees involved in planning Cauce’s appointment events. Various emails sent in the days and hours before the public vote — including those written by Board of Regents Chairman Bill Ayer, search-committee Chairman Kenyon Chan and John Thornburgh, a consultant who coordinated the UW’s presidential search — largely describe the board’s pending action as an “announcement” rather than an uncertain outcome. The records also show Ayer drafted a script in advance of the board meeting that detailed which regents would make the motion and second to appoint Cauce. “The motion carries! !” Ayer’s script noted, without providing words to the alternative. Thornburgh also informed Chan in an email sent Oct. 9 about a discussion he had with Cauce over pay issues. Ayer, who was out of town last week, did not respond to a request for comment about the records. Norm Arkans, the UW’s associate vice president for media relations and communications, last week denied that regents made a decision before the public vote. “The board chairman isn’t going to call a special meeting unless he knows the board is prepared to make a decision, but the decision wasn’t made until the board took a vote on it,” Arkans said. A de-facto decision by regents to appoint Cauce prior to a public vote would violate the state’s open-meetings act, which was established to ensure transparency in government decision-making. The law requires governing bodies to deliberate and vote on hiring and other issues during public meetings. It allows boards to meet privately “to evaluate the qualifications of an applicant for public employment,” but prohibits them from conducting a secret ballot or otherwise coming to “a collective positive or negative decision” behind closed doors. UW regents have had past troubles complying with the law. Last April, a judge ruled the board violated the law on 24 separate occasions from 2012 to 2014, when regents discussed business during dinners held at the university president’s home. A judge also ruled in 1995 that regents broke the law during a presidential search after The Times sued over the secrecy of that process. The UW has long used a closed search process to find its presidents that involves not publicly disclosing names of finalists or other candidates. Washington State Universityis now engaged in similar closed search for its next president, and Western Washington University will soon decide whether it will publicly interview finalists for its top job. 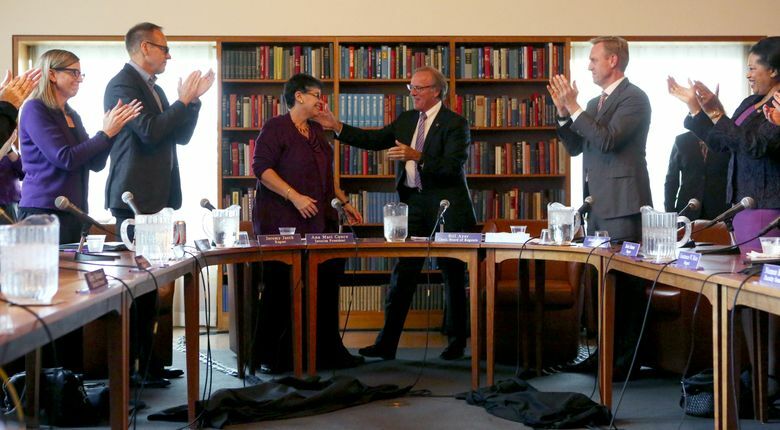 Shortly after regents publicly named Cauce president, The Times questioned UW officials about whether a private decision had been made in advance of the public vote. Arkans also said then his staff drafted a news release and made other arrangements in the eventuality that regents appointed Cauce, but such preparations did not indicate the matter had been decided. On Oct. 16, The Times formally requested UW emails and other records about the search. On Feb. 18, the UW mailed a first batch; a public-records officer said last week a second batch is expected to be released within two weeks. Along with emails, the released records included copies of text messages and a variety of statements to notify alumni, donors, faculty and staff and the public about Cauce’s appointment that were prepared prior to the board’s vote. The day before her appointment, Cauce revised a quotation attributed to her in a news-release draft titled, “AMC named president,” that staff members began crafting four days before the vote. The records also revealed the identity of another candidate: retired U.S. Army General Pete Chiarelli. The name of Chiarelli, a former vice chief of staff of the U.S. Army and Seattle native, surfaced in Ayer’s response to Thornburgh’s email about notifying “prospective candidates” before the regents’ public announcement. Chiarelli confirmed his candidacy to The Times last week, saying he met once early in the process with Ayer, and later with a search consultant in Washington, D.C. He added he received a courtesy call about a day and a half before Cauce’s appointment. “They said the announcement was going to be made, but it wasn’t going to me,” he said. In the days before the Oct. 13 meeting, Chan sent several emails to regents and others about efforts to limit disclosing information about the search and candidates following the board’s action.